The Halle Institute for Global Research and Learning and the Fox Center for Humanistic Inquiry (FCHI) offers Fellowships to support research outside the United States for juniors in any school (Arts and Sciences, Business, Nursing) contemplating honors theses or other types of senior capstone projects. 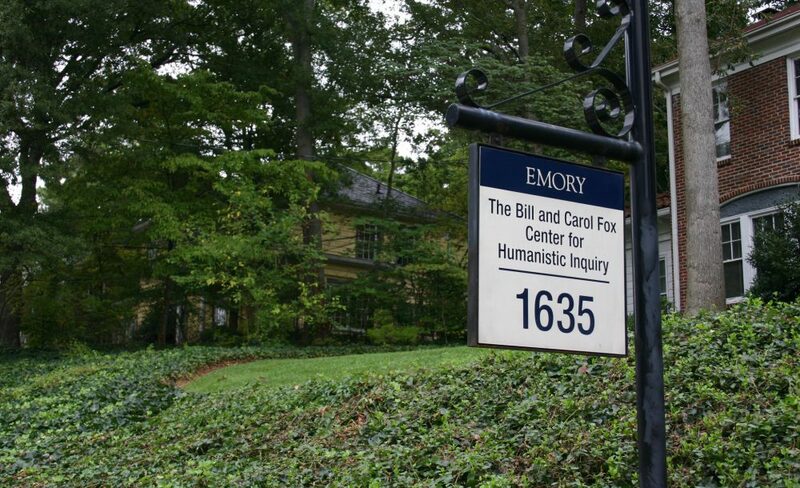 The international research portion of the fellowship is followed by participation in the vibrant research community of Emory faculty, graduate students, and visiting scholars based at the FCHI and the Halle Institute. The Halle Institute – FCHI Undergraduate Global Research Fellows Program is designed for undergraduate students in all schools, departments, and programs whose projects would benefit from conducting research outside of the United States and whose scholarship has a humanistic component. As most Emory undergraduates could likely attest, receiving an email from one’s academic department is rarely a thrilling – or even a particularly enjoyable – experience. Often, one scarcely finds the time in the helter-skelter of university life to read yet another forwarded notice for yet another event or program. But in the spring semester of 2018, as I was combing through my email archives, I happened upon a message about the Halle-FCHI Global Fellows Program which had been forwarded to me by the Philosophy department – and which would profoundly change the course of my year. How many undergraduate students could honestly claim the following: I received a fellowship from my university to undertake summer research in Paris? In fact, the Halle-FCHI program makes an even better offer – although Paris was my research location of choice, Global Fellows may propose to conduct research at any site in the world that is relevant to their senior thesis. But this fellowship is no summer vacation; it is a professional research experience the likes of which are rarely if ever afforded to undergraduate students, especially in the humanities. Without this experience, I would never have arrived at the novel directions that I am currently pursuing in my honors thesis. My thesis approaches contemporary debates in queer theory regarding identity and temporality by revisiting the questions of truth and of history raised by 20th-century philosopher Michel Foucault’s interpretation of his intellectual precursor, Friedrich Nietzsche. Through the Halle-FCHI Global Fellows Program, I was able to visit the recently opened Foucault archives at the Bibliothèque Nationale de France, where I spent three weeks transcribing a total 256 pages of unpublished Foucault manuscripts about Nietzsche. These manuscripts have radically advanced my understanding of truth and history in Foucault’s Nietzsche; while Foucault is most recognized in Nietzsche scholarship for his work, in the late 1960s, on Nietzsche’s genealogical method of historico-philosophical inquiry and the power relations that genealogy finds embedded within the history of accepted truths, my archival research recovered a much earlier (mid-1950s) and hitherto unexplored phase of Foucault’s reading of Nietzsche. My thesis will argue that this early phase, in which Foucault takes up Nietzsche’s way of “philosophizing with a hammer” as an attack upon the metaphysical grounds of Western thought, itself becomes the philosophical ground of the later Foucault’s historico-philosophical œuvre – and so also the implicit ground of Foucaultian queer theory. Foucault’s Nietzsche rigorously maintains that “to perish through Absolute Knowledge could belong to the foundation of being”: any knowledge which would lay claim to Absolute – universal, transcendental, final – metaphysical foundations can only do so in disavowing its own foundationlessness as the accident of history, of discourse, of perspective that it is in spite of itself. If Foucault’s Nietzsche destabilizes Absolute Knowledge, I will argue that he may also destabilize heteronormative “knowledge” of sexuality. Thus, my thesis will follow the tandem questions of Foucault’s Nietzsche – “What is truth?”, or better, “What is the political history of truth?” – and of the later Foucault’s History of Sexuality: What does it mean that sexuality has been produced as the “truth of ourselves”? I will suggest that re-reading queer theories of identity and of temporality through Foucault’s Nietzsche may open onto new understandings of the violence as well as the resistance that are occasioned in the historical construction of sexual identity. As its title suggests, my interdisciplinary project seeks to contribute to Foucault scholarship as well as to Nietzsche studies and to queer theory. But the title also reveals the extent to which many of my scholarly contributions have become possible with the support of the Halle-FCHI Global Fellows Program: “Perishing from Absolute Knowledge with Foucault, Nietzsche, and Queer Theory” is obviously inspired by the line of Nietzsche’s (see above) which Foucault also uses as the title of what is perhaps the most outstanding of his archival manuscripts. And without the unique opportunities and ongoing support that I have enjoyed as a Global Fellow, I could never have discovered these at-once foundational or grounding, anti-foundational or un-grounding, and ground-breaking writings that have become the core of my thesis. Never have I been more glad that I checked my email. My project analyzes the stigma continuity of leprosy in Brazil from 1923 to 2018. Despite political changes and medical advances, the stigma against leprosy persists in Brazil. In fact, the state isolated patients of leprosy in leprosaria for thirty-two years after doctors began to prescribe a cure. The Halle Institute for Global Research funded my time shadowing at the Eduardo Menezes Hospital of Infectious Disease, a specialized center for leprosy. There I observed consults with sixteen patients of leprosy with physical therapists and physicians. Within that week, I also visited a leprosarium that still houses over 200 patients. There, I gathered narratives of patients who suffered isolation. The experience expanded my project from 4 patient narratives to 10 patient narratives in just one week. On this journey, I met a woman in a leprosaria who shared her story with me. She was diagnosed with leprosy when she was just 21 years old in 1955. Immediately, her mother labelled her a dirty sinner for her diagnosis. Her husband, aware that she would live the rest of her days in isolation, went into deep depression. He took his life soon thereafter. She left her baby with her mother while she went to her husband’s funeral. Upon return, the baby was missing. When she asked her mother, her mother said she had sold the baby to some strangers on the street. A couple of days later the police arrived to take the patient away to isolation. This patient lost her husband, daughter, and family because of sickness. I was amazed that despite all she suffered she is not bitter today, and even shares her story openly. The stories contributed to my data collection but also made me reflect on what I am trying to accomplish with my project and inspired future projects. I realized that, beyond writing a thesis, the main goal of my project is to help spread awareness of the discrimination of leprosy patients. In the leprosarium, I met children of leprosy patients seeking reparations from the Brazilian government. From 1923 to 1976, the Brazilian government took the children of leprosy patients and placed them in orphanages. I heard the stories of the traumas of being stripped from their families and made “orphans” by the state. This inspired to document the oral narratives of the children of leprosy patients in the future and conduct research on the impact isolation had on the second generation. As I was pursuing a directed study to investigate what would become my Honors project, my adviser encouraged me to integrate archival research into the project and find opportunities to fund such experiences. Somehow it had never occurred to me that I as an undergrad could conduct scholarly independent research abroad and have it productively contribute to my work. But after receiving funding from a music department research grant and the bulk of my support as an Undergraduate Global Research Fellow with the Halle Institute and the Fox Center for Humanistic Inquiry (FCHI). In the process of searching for undergraduate funding options, I discovered the application for the newly-established Undergraduate Global Research Fellowship, and I knew that I wanted to be among the first to seize this new opportunity on campus. The funding from the Halle Institute supported a ten-day archival research trip in Brussels. While my work with Gabriel Fauré (the primary composer of interest in the project) initially explored elements of his individual compositional aesthetic, visiting Brussels inspired me to analyze Fauré with larger, more transnational terms. Currently, Fauré’s music will be a case study in the engagement between Symbolist poetry in francophone Europe and French-language vocal music (mélodie). The cross-engagement of the literary and musical movements is furthermore situated in the context of linguistic nationalist projects in France and Belgium, as ideals surrounding language use responded to the French Revolution (1789) and Belgium’s independence (1830). Another influential figure in my project is Belgian lawyer turned art critic Octave Maus. He created and led two avant-garde groups that coordinated art and music festivals in Brussels. Fauré attended the festivals twice; yet even when Fauré was not present, his music was played on a bi-yearly basis. This lattermost fact, which I uncovered in Brussels, asserts Fauré’s value in French-speaking musical life beyond his usual Parisian circles, which is one of the more strident elements of my work. This assumption is complicated by the fact that, within France, Fauré was at times perceived as an outsider because of his non-Parisian birth and lack of conservatory training. After further reading about the relationship between French-speaking Belgians and French nationals, Fauré’s situation uncannily aligns with how the two socio-cultural groups were often in discord with one another because of Belgium’s “hybridized” social and linguistic identities. Visiting Brussels was important for this project primarily because the secondary literature about Belgian musicianship during the fin-de-siècle is limited. Considering that one of my long-term goals is to contribute to this dirge in scholarship, I was grateful for the opportunity to engage with some of the primary sources in their native context, which are held at the Contemporary Art Archives (AACB) of the Museum of Fine Arts of Belgium. The project is compelling because of the ways in which vocal music will be put forth as works which actively mirror and respond to the linguistically reformative principles guiding Symbolist writings. My research in Brussels demonstrated that musical life was remarkably in-tune with its surroundings and participated in supporting, criticizing, and collaborating with artistic communities outside of its discipline. As I begin pursuing doctoral work in Musicology, I hope to continue in this spirit of using music as a means to discuss cultural histories, rather than treating it as a cultural artefact. Without the Halle Institute’s support of my research, I doubt that I would have been able to unveil the multi-layered depth that my project has gained since returning from my summer research experience. The Wycliffite translations exist in various manuscripts, making a wider study of the manuscripts crucial. I read Wycliffite manuscripts at the British Library and Oxford’s Bodleian Libraries in the UK. The Bodleian is the world’s main repository of Wycliffite manuscripts. This allowed me to understand the variety of ways the medieval man used and engaged with a Wycliffite text. In addition to my time reading manuscripts, I made a brief visit to the Rashi House in Troyes, where I also met local scholarship at the Greater Troyes Media Library. The reception history of Psalms is a field of scholarship that only recently became of real interest to scholars around the world. In medieval monasteries, the entire book of Psalms was chanted every week. Understanding Jewish influence on Christian scholarship during this difficult period for interfaith dialogue proves an intriguing task. Moreover, both Nicholas of Lyra and John Wycliffe’s works became strong influences on the Reformation. Wycliffe influenced Jan Hus’s theology to minister to the populace in their vernacular. Meanwhile, as the saying goes, “Si Lyra non lyrasset, Lutherus non saltasset” (“Had Lyra not played his lyre, Luther would not have danced”). When I arrived in Brazil to do the archival portion of my thesis research, I thought I knew more or less of what to expect. Before travelling, I had studied much of the scholarship that had already been written on Brazilian composer Antônio Carlos Gomes, the subject of my study. I had familiarized myself with his biography, his political views, and his music. Because my thesis looks at the racial and ideological implications of the composer’s operas, my time in Brazil was to be spent combing through the composer’s numerous correspondences with his elite contemporaries, looking for any mentions of race and politics. Of course, there were plenty. I came across numerous correspondences with prominent Brazilian abolitionists, as well as letters in which he discussed political matters with his friends and family. These finds came as no surprise to me—Gomes’ political involvement has been written about before, so I expected to learn more about it through my study of his correspondences. What I did not expect, however, was the place that Gomes holds in the Brazilian public conscious, one that celebrates an image of the composer that is seemingly at odds with the Gomes I encountered in the archives. When I arrived in Campinas, São Paulo, I took a walk through the downtown area (Centro) on my first day to familiarize myself with the area. I was immediately stunned by a huge stature of the composer in the center plaza, and subsequently surprised by his tomb, a large mausoleum-like structure that sits firmly in the middle of the city. Monuments like these can be found in other major Brazilian cities, such as São Paulo and Rio de Janeiro. All of them praise the “grande maestro” (great composer) that was Carlos Gomes, claiming him and his success abroad as a victory for all of Brazil. This celebration of Gomes was echoed by the Brazilians I talked to, many of whom spoke highly of the composer and his importance to Brazilian art. Naturally, I began to wonder. How could the composer, who in his letters and correspondences spoke so negatively of the Brazilian Republic (founded in 1889) and died with a deep disdain towards Brazil (he described it as having dealt him “great injustices”), become such a national symbol for modern day Brazilians? The opening of his seminal opera Il Guarany, for example, is the opening song of the daily government radio station. As I continued my research in the Brazilian archives, digitizing his correspondences and original musical manuscripts, I kept encountering people who saw Gomes as a national hero of sorts, even though Gomes longed for nothing for than to be a “European” opera composer (his pieces were composed for Milanese premieres). In considering these current perceptions of the composer, I began to examine the early historiography of the composer and his music. Early musicologists wrote about Gomes as the progenitor of Brazilian art music. They positioned him as first in a long line of Brazilian composers that would write in a nationalist style. What is peculiar about this, however, is that Gomes’ musical style could hardly be considered national—passages from his pieces sound like they could be lifted directly from Verdi or Rossini operas. What was clear to me was the immense hagiography that went into the construction of Gomes’ image in the Brazilian public consciousness. Early scholars (and even some today) glossed over Gomes’ political leanings, categorizing him as unequivocally “apolitical.” In these portrayals of Gomes, he was lionized into the pantheon of Brazilian composers and rendered as a national symbol. My thesis, which looks at the Brazilian composer through a more critical lens, joins the recent wave of Gomes scholarship that pushes back against hagiography that early historiography engaged in. Instead, my thesis considers the composer’s operas in a deeply political light, examining his engagement with racial and national ideologies and his constructed image(s) of Brazil and of “Brazilianness.” I argue that the “apolitical” characterizations of Gomes made by early scholarship, that which projected him into the national public consciousness, do not allow for a holistic consideration of the composer’s place in Brazilian history. Instead, I present a reading of Gomes in which his art and politics are inextricably linked. Broadly, this could be said for all music. Music goes beyond its sounding space and has very real, humanistic implications, for both the artist and the listener. I am just using Gomes as a case study to make this point.